The Ukrainian Catholics of Dauphin organized their first parish in 1916. They held their first service in an old Anglican church that they had purchased and moved into town. By 1936 it could not meet the needs of a growing parish. This church was built between 1936 and 1939 by volunteers from the parish. It was designed by the Very Reverend Philip Ruh, O.M.I. 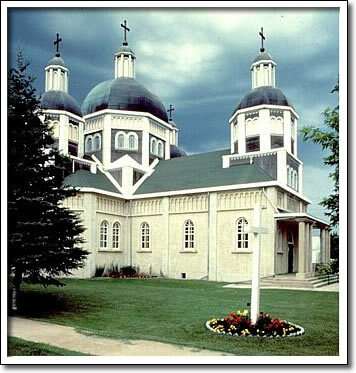 (1883–1962), whose architectural talents assisted many Ukrainian Catholic parishes throughout Western Canada. With their ambitious size and decorative appeal, these churches designed by Reverend Ruh came to be known as "prairie cathedrals." The Dauphin church is one of his best. In 1957, the noted iconographer Theodore Baran (1910–1995) undertook the religious painting of the church interior. His frescoes, icons and murals create one of the most visually spectacular interiors in the Province. In 1990, the parish undertook construction of a new church, but respected their architectural heritage by preserving this landmark. The Historic Ukrainian Catholic Church of the Resurrection continues to serve the community as a site of a variety of cultural activities.